And Here We Go! 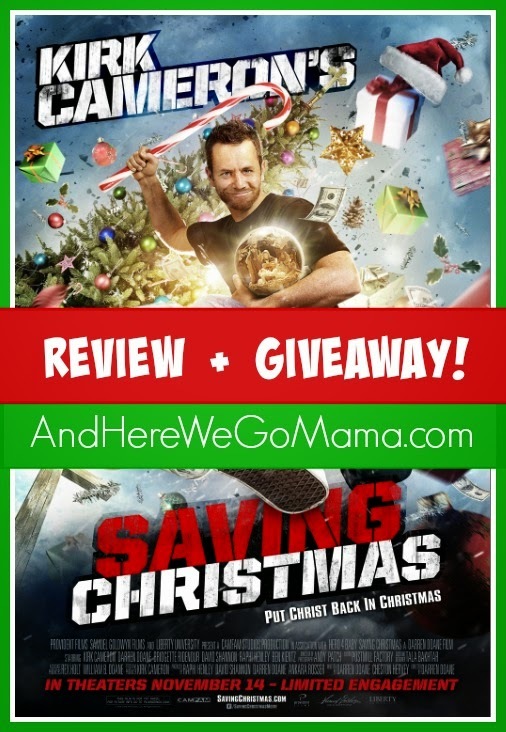 : Saving Christmas - Giveaway + Review! Saving Christmas - Giveaway + Review! When I was asked to pre-screen this movie in exchange for my honest review, I was SOOO excited! 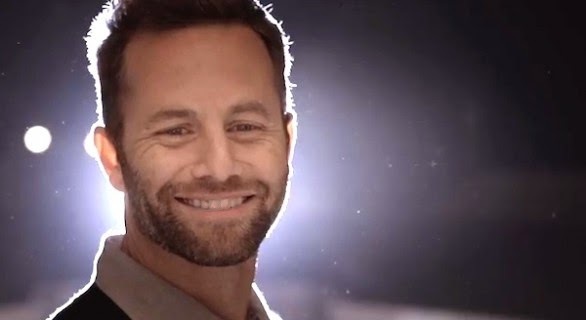 I love all Kirk Cameron's projects (The Way of the Master is such an incredible evangelistic tool! Wow! ), so I had high expectations for his new movie, Saving Christmas. This Christmas, have your family join with Kirk Cameron’s family and dive headfirst into all the joy, dancing, celebration, feasting, imagination, and traditions that glorify the true “reason for the season.” KIRK CAMERON’S SAVING CHRISTMAS is an engaging story that provides a biblical basis for our time-honored traditions and celebrations, and the inspiration to stand strongly against a culture that wants to trivialize and eliminate the faith elements of this holy season. So take in the splendor; take in the majesty; take in the story. Take it all in… and let’s put Christ back in Christmas! Saving Christmas comes to theaters this Friday for a limited time - only two weeks! Click here to go to the movie's website to learn more and find a theater near you. As some of you may know, I've had my foot in legalism in the past, thinking that Christmas was a pagan holiday that 'real Christians' shouldn't celebrate. This was back in my skirt-wearing-no-hair-cuts time of struggle. Click here to learn more about my journey to freedom in Christ. So, this movie holds a special place in my heart because it addresses many of the common objections to this incredible holiday. So this is Christmas. Pull out your best dishes, finest linens, nicest silverware, the biggest ham, every side dish you could possibly imagine, and the richest butter. It's time to feast. . . Make the most of Christmas. Fill your table with laughter, stories. . . Don't miss one single opportunity to pass along the JOY of the season. Don't buy into the complaint about materialism during Christmas. Sure, don't max out your credit cards or use presents to buy friends, but remember this is CELEBRATION of the Eternal God taking on a material body, so it's right that our holiday is marked with material things. Things we can see with our eyes and touch with our hands - ribbons, decorations, hot chocolate, lights, presents, giant ham, stuffing, fudge, Christmas cards, and more hot chocolate. How could we possibly capture all of it? We could eat until we split at the seams, smile until our cheeks hurt, and laugh until our bellies ached. We could sing until our voices grew hoarse, and we could not begin to scratch the surface of this glorious day. Throw your doors open and invite the world into the glorious celebration of our King! This is our story, our tree, our lights, our presents, our songs, our St. Nicolas, our home, our future, our Savior. Oh, friends, it's just incredible - this freedom to CELEBRATE our Lord and Savior! I've tried it the other way, the no-tree-no-lights-no-joy way, and it just didn't feel right. I was filled with judgment for others instead of joy for Jesus. If you've wondered how bringing trees into our homes glorifies our Savior, then you need to watch this movie. If you think Santa and satan go hand-in-hand, then you need to watch this movie. Seriously, plan a date night, take your hubby to the movies, and be prepared to be FILLED with JOY for the upcoming season of the ultimate birthday party! Kirk Cameron explains it in just a great way, conversationally, as he talks to his ba-humbug brother-in-law during the family Christmas party. It's so entertaining, so relevant, and so needed right now as we gear up for the Christmas season. Ready for the giveaway?! Of course, right! The winner will be announced after the raffle ends, and he or she will have 48 hours to reply to my email before a new winner is chosen. I'm SO excited to be sharing this with you, and I hope you'll join me in supporting this fabulous movie and Christian filmmakers! Stay tuned for another great Christmas movie giveaway going live VERY soon! I am excited to celebrate Christmas with my family. I love this time of year! Thanks for the review and great giveaway! I love Christmas. I love the lights, the decorations, the food, the specials on TV, the movies, the songs...most of all I love how excited the kids get plus the Christmas pageant at school. Love the Christmas pageant! Looking forward to my new college grad and senior college students being home. The whole family together for Christmas - what could be better? Looking forward to going through the book 'Unwrapping the Greatest Gift' - Voskamp with my family. This year I am excited about doing Handel's Messiah Family Advent Reader during the holidays!